Fun Sandwich and Bread Cutter Shapes for kids - 8 Crust & Cookie Cutters - PLUS 6 Mini Vegetable & Fruit Stamp Set and 10 Food Picks -Turn Vegetables, Fruits, Cheese, and Cookie Into Fun Bites by stbeyond at Animal Backgrounds. MPN: SYA-00125. Hurry! Limited time offer. Offer valid only while supplies last. 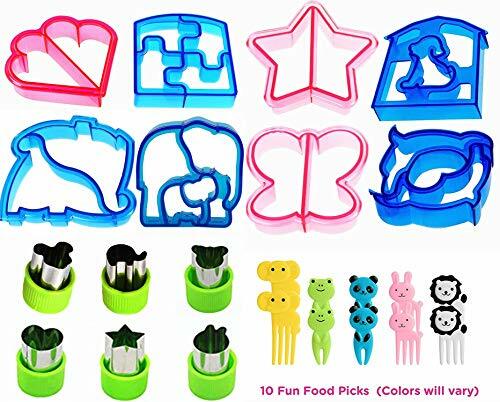 This set includes 8 BPA free sandwich cutter shapes, butterfly, elephant, dolphin, heart, dinosaur, puppy, star, and puzzle. PLUS 6 small mini size metal stainless steel veggie cutters,10 miniature animal food picks and forks. Perfect for kid's school lunches or bento box accessories. Try a new shape in your child's lunch boxes everyday of the week. Colorful sandwich cutters are easy to use and spice up any boring lunch in a pinch! This set includes butterfly, heart, dog, star, dinosaur, puzzle, elephant, dolphins, and train. Our kid-tested and approved cutters are BPA & Phthalates-free food grade plastic. Add a little zest to any meal with these fun vegetable cutters. Can also be used to make fruit, cheese, cookies, and bread look appetizing for kids and toddlers. Impress guests by making a unique fruit salad. Shapes include rabbit, heart, star, micky, star, and 3 flower shapes. Made of stainless steel.Bonus animal picks add a special adorable touch to any meal. This kit includes 2 giraffe, 2 pig, 2 rabbit, 2 elephant, and 2 lion. Reusable and BPA-free. Impress your friends and family by creating fun sandwiches and bite-size fruits and vegetables. Perfect for picnics, baby showers, friends and family parties.Phthalate free, BPA free, mercury free, lead free - Safe to use for your children or toddlers because the plastic crustcutter sealer sandwich molds are designed with no sharp edges! Sandwiches, soft fruits & veggies, cheese, pancakes, donuts, tortillas, cakes, cookies, toast, biscuits and MORE! Children can be picky eaters. Convincing them to eat fruit and veggies can be a chore. But this set transforms veggies into fun shapes kids can't get enough of, making it easy to feed kids the healthy foods they need! Designed in the USA and loved by boys, girls, and adults. Whip up animal fun cut shaped bread, fruits, vegetables slice cutouts in seconds! Perfect for making custom sandwiches or cutting cheese and edible snacks. Color: pink, blue , green , ect.